For those busy nights when you are short on time but want to serve your family a hot and flavorful dinner, try this delicious pasta recipe. 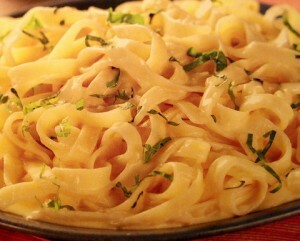 Tender strands of fettuccine coated in a creamy Parmesan sauce will satisfy even the picky eaters at your table! 1. In a large bowl, beat the butter with electric mixer set on low speed until smooth. Add the whipping cream and Parmesan cheese; stir until well blended. Set aside. 2. Cook the pasta according to the package directions; drain well. Add the cooked pasta to the butter mixture. Toss pasta using two forks to coat well. Add the salt and pepper. Sprinkle with shredded basil leaves. Makes 4 servings.